The 14U Dallas Tigers coached by Cameron Watten came away with USSSA baseball tournament championship in Tulsa, Oklahoma. Congratulations boys! Huge tournament to win. 13U Dallas Tigers coached by Tommy Hernandez win some epic battles in USSSA Tulsa Oklahoma baseball tournament to take home the championship! Great wins boys! Congratulations to the Dallas Tigers Cameron Bankston 12u team for battling to a hard fought 3-2 victory against 918 Tulsa in the Texas-Oklahoma shootout final in Grapevine Texas. I am very proud of all the kids and parents for staying tough and fighting though alot of adversity this season. My hat is off to head coach Cameron Bankston for showing these kids how to win and play as a team. Way to go! The 15U Dallas Tigers coached by Tommy Hernandez win the AABC Ken Griffey Jr Division National Championship on Tulsa, Oklahoma. The Tigers went 5-0 to win the AABC Ken Griffey Jr. National Championship held in Owasso, Oklahoma. 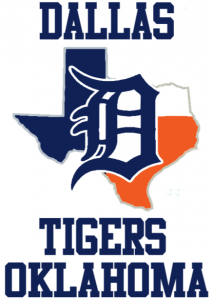 Battling through temperatures ranging from 109 to 116 degrees, the kids executed all week with fantastic pitching and defense and some timely clutch hitting to bring the Dallas Tigers Baseball Club it’s 18th National Championship and the Tigers 7th AABC Championship. All 16 kids contributed to this championship throughout the week with Tanner Gardner receiving the Outstanding Hitter Award and Brandon Maine was named Tournament MVP. Brandon started and finished games 1 and 5 to deserve this award. Tanner hit .500 for the tournament. Congratulations to all the boys for following up last years Super Series National Championship. In what turned out to be a rematch of the Shreveport Super NIT Championship between the Tigers and the Oklahoma Rays, the tables were turn as the Tigers came up short this time against the Rays 7-4 to come home with a very respectable 2nd place finish. In what has become one of, if not, the largest regional tournament of the season the Dallas Tigers took it to the finals. With a field of 48 teams the Tigers managed to earn a top 16 seed winning their three game pool heading into the Championship bracket on Sunday. After starting off sluggish in the pool with a 5-5 tie against a respectable Tulsa Cardinals team, the Tigers took care of business running off five wins to get to the rematch game against the Rays in the championship. Hitting was lead by the hot bat and fast feet of Ty Manning who clubbed three homeruns, two of which were grand slams. He earned them the hard way as all three were in the park round trippers. Manning went 7 for 13 and accounted for 13 RBI’s to lead the Tigers. The offense continued to roll outscoring their opponents 74-28 in the seven games. While the Tigers pitching seemed to waver at times it was once again a complete team effort that managed to guide them through a full weekend schedule. Jared Martin and Jake Whitbeck had strong complete game performances on the mound. Congratulations to the Tigers for battling back through a full seven game weekend of play in another competitive tournament.